Features a splash-proof, aluminium chassis. MAXWELL Technologies, represented by Glyn High-Tech Distribution , has unveiled a compact, fully integrated, 48V multi-cell Boostcap ultracapacitor module for heavy-duty transportation and industrial energy storage and power delivery applications. Richard Smith, Maxwell’s executive vice president for strategic business development, said the new BMOD2600-48 module consists of 18 2.7V Boostcap MC2600 cells based on a recently announced technology breakthrough that enables the cells and multi-cell modules to store more energy and deliver more power per unit volume and last longer than any other commercially available ultracapacitor products. Mr Smith said the 48V modules are specifically designed to meet end-user requirements for durability and maintenance-free operation and have undergone several months of testing and evaluation by selected customers, including ISE, a San Diego-based integrator of hybrid-electric drive trains for buses and other heavy vehicles. David Mazaika, ISE’s president and chief executive officer, said the beta units’ performance met expectations and was consistent with Maxwell’s specifications. “ISE introduced ultracapacitor-based drive systems to the heavy vehicle market because they deliver longer operational life and higher braking energy recapture efficiency, resulting in lower fuel consumption and emissions compared with battery-based systems,” said Mr Mazaika. The BMOD2600-48 modules are encased in a rugged, splash-proof, aluminium chassis. They weigh 13.5kg and are 13.4L in volume (420mm L/200mmT/160mm W). These durable ‘smart boxes’ include temperature and voltage monitoring and internal cell balancing that give designers ‘plug and play’ solutions, plus module-to-module balancing that makes them versatile building blocks for systems with higher voltage requirements. Boostcap ultracapacitors deliver up to 10 times the power and longevity of batteries, require no maintenance and operate reliably in extreme temperatures. In transportation applications, they efficiently recapture energy from braking for reuse in hybrid drive trains, reducing fuel consumption and emissions. They also provide compact, lightweight, ‘life-of-the vehicle’ solutions to stabilise automotive power networks and power new, all-electric subsystems, such as drive-by-wire steering. 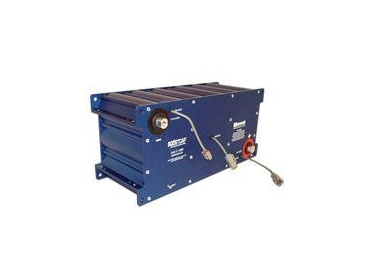 In mission critical industrial applications, where backup power is critical for continued operation or a soft shutdown in the event of power interruptions, the devices provide reliable, cost-effective, maintenance-free energy storage. In wind turbine blade pitch, braking systems and other industrial applications, they provide a simple, solid state, highly reliable, solution to buffer short-term mismatches between the power available and the power required. Maxwell is a leading developer and manufacturer of innovative, cost-effective energy storage and power delivery solutions. The Boostcap ultracapacitor cells and multi-cell modules and Powercache backup power systems provide safe and reliable power solutions for applications in consumer and industrial electronics, transportation and telecommunications. Maxwell’s Condis high-voltage grading and coupling capacitors help to ensure the safety and reliability of electric utility infrastructure and other applications involving transport, distribution and measurement of high-voltage electrical energy. Maxwell’s radiation-mitigated microelectronic products include power modules, memory modules and single board computers that incorporate powerful commercial silicon for superior performance and high reliability in aerospace applications. The Maxwell BMOD2600-48 is available immediately from Glyn High-Tech Distribution.